Two days is definitely not enough in London, but it was the perfect sampling of this classy, iconic city. I fell in love with the style, class, history, and prestige evident in every corner that I saw of this beautiful place. On our second and final day (see the first day here), we took the royal tour of London starting at Westminster Abbey where Kate and Will were married, then Buckingham Palace for the changing of the guard parade, and finally a stroll through Hyde Park and Kensington Gardens, waving to the royal couple as we passed by. Kensington was the perfect neighborhood to shop and grab a bite to eat on our way out of town. I had read ahead of time that the line to enter Westminster Abbey can wrap around the entire building. We woke up early, grabbed coffee and to-go breakfast from the one of the small grocery markets on the way, and then took the tube to Westminster station. Luckily, we were early enough to enjoy a leisurely picnic on the lawn between the abbey and Big Ben. Westminster opens at 9:30 AM, so as soon as we saw people forming a line, we jumped in place to be some of the first inside. Our timing was perfect, as we were able to enter as soon as it opened and it was not too crowded, yet. Westminster is not only a church famous for its historical events, but a resting place for some of England's most beloved royals, leaders, innovators, and creatives. I loved reading every dedication, the eloquence and sincerity behind the words moved me and made me wish that this romantic language still existed. Today, we're lucky if we get a "K" in response to a text message. I encourage you to visit the abbey and take your time listening to the free audio guides and reading each of the inscriptions, but don't try to take any pictures! Next, we strolled around the corner to Buckingham Palace just in time for the changing of the guard parade at 11:00AM. In severe contrast to the previous night, we found the palace surrounded by eager crowds made up of casual tourists and obnoxious tour groups following colorful umbrella leading tour guides. Additionally, this was when we encountered our first smattering of London rain. We stood under a tree and I used a laminated map to cover my hair from the light rain, since I lost my umbrella on the tube. As soon as the rain stopped and before the parade ended, we moved on toward Hyde Park to hopefully beat the crowds. I absolutely loved my experience strolling through Hyde Park. It was so perfectly London to me. You could identify the locals by their golf umbrellas which they carried as if they were an extension of their arm, and moved perfectly into position when the next, heavier rain shower began. There were ducks playing in the pond, and people boating on the James River. There were mothers pushing strollers and old men taking a rest on nearby benches. Hyde Park flows right past the Princess Diana memorial into Kensington Gardens, which ends at Kensington Palace where William and Kate live. There were the most beautiful rose gardens that I was unable to photograph because my camera was getting too wet from the intermittent light rain showers. The rain cleared again by the time we made our way to Kensington Palace. By then we were hungry for lunch, so we skipped our tour of Kensington Palace and explored the shops and restaurants in the area. Sadly, our time in London had come to an end. We took the tube from Kensington back to Tower station to collect our bags from our hotel. Then we took the Heathrow Express back to the airport to catch our flight to Paris. I would love to return to London someday. Next time, I hope to rent an Airbnb and live like a local for a week, maybe in the fall or at Christmas. 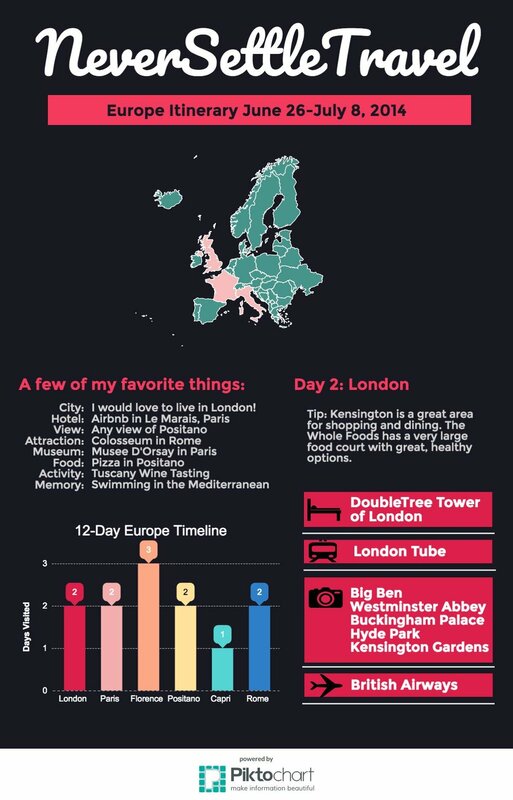 What's on your London itinerary?